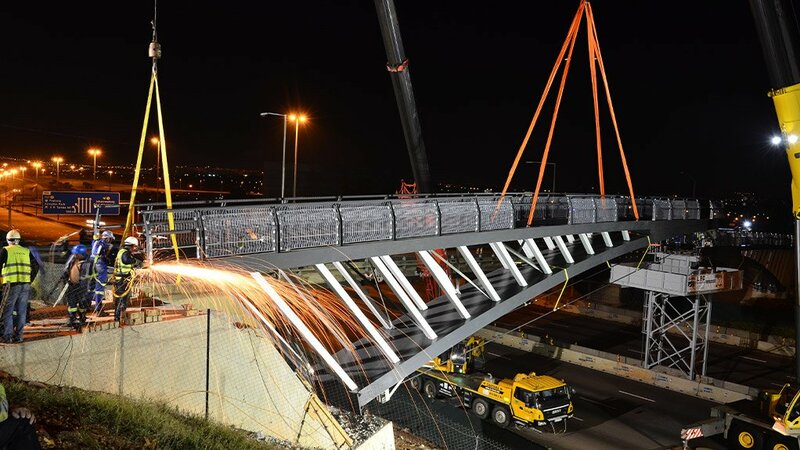 The new pedestrian bridge over the N1 at Erasmusrand will soon be ready for use by pedestrians and cyclists near Hoërskool Waterkloof, in Pretoria, says the South African National Roads Agency Limited (Sanral). The bridge, which was built in under 20 hours over this past weekend, only needs to have the in situ concrete deck cast, which will take about a month, the agency notes. 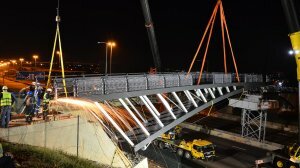 The bridge, which cost about R22.3-million, is expected to remain standing for decades, considering that Sanral’s bridge management system ensures proper inspection, it adds. Sanral Northern Region manager Progress Hlahla says the agency is hopeful that this new bridge will reduce incidences of pedestrians being knocked down on the highway. “The new bridge has been in design to replace an old damaged one which was demolished in May 2016 [owing to] to safety concerns. 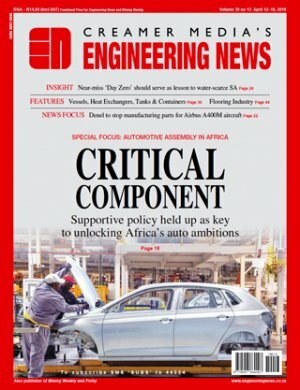 Its elegant structure, with an arched steel plate girder substructure and a cast in situ concrete deck, has been engineered to international standards with pedestrians and cyclists in mind,” Sanral project manager Alan Agaienz points out. He adds that the structure was erected in two separate sections and welded in the middle to create the permanent structure. “The temporary middle support pier will be removed after 28 days when the concrete in the deck has cured. This design was chosen out of five possible options because it was the most cost effective and aesthetically pleasing solution,” he explains. The bridge was designed to be manufactured off-site and to be self-supporting without any central pier in the median.